Oak flooring, unfinished or prefinished, will enhance your home’s look and value. 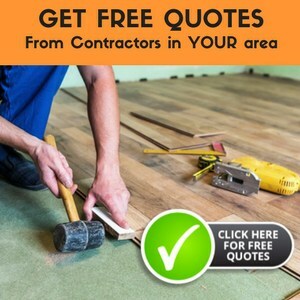 Pre-finished oak flooring makes flooring installation fast and easy, but antique wood flooring adds character than you can’t get from “new” oak wood flooring products on the market today. Whether you choose red oak flooring or white oak flooring, your oak hardwood flooring decision can’t go wrong. Once a mighty tree, now a mighty floor. That’s right, oak is one of the best and a common hardwood used in flooring. There are two types of oak hardwood; red oak (quercus ruba) and white oak (quercus alba). Oak hardwood flooring is one of the more common hardwood floorings and is great for adding a touch of style and elegance to your home. Wooden floors also add a sense of warmth to any room, but what makes oak floors so popular? There are different grades of oak and these are determined by appearance. All grades are equally as strong and serviceable. These grades include clear, select, and common. A clear grade of oak flooring is generally free from any eye catching blemishes but can still contain streaks and pinworm holes. A select grade of oak flooring is almost clear but contains more natural color variations and knots. Of the common, there are two grades which have more markings and bring better character to floors. Of the two types of oak, red is America’s most popular flooring option and is reddish in color with a coarse grain. It’s a dense wood and resists wear and tear but not as well as white oak. White oak is brown in color and has been known to have a grayish hue. The grain in white oak is similar to that of red but has more burls and swirls. White oak, with a Janka rating of 1360, is harder and more durable than red oak, which has a Janka rating of 1290. Oak has been used for centuries in flooring and much of the antique oak flooring used today has been reclaimed from barns and buildings that were constructed hundreds of years ago. Antique oak flooring ages beautifully and gives a feeling of elegance to any room. When looking at purchasing oak hardwood flooring it is essential to weight the pros and the cons. As you know, hardwood flooring can be quite an expensive choice, but is it worth it? In short the answer to this question is undoubtedly yes. The cost over the years will generally be less that than the cost of both carpeting, and maybe even tiling. On average, households replace carpets after ten years and vinyl and tiles after twenty years. Oak flooring, on the other hand, if properly maintained, will last a lifetime. Of course, oak wood flooring is not without its faults, the main one being water. Excess moisture can damage this beautiful floor and therefore additional care is needed in bathrooms, laundries and around kitchen sinks. All spills should be wiped up immediately to prevent water from soaking in and warping your hardwood floor. Furniture glides should be used to prevent scratches. Regular sweeping and vacuuming will keep dirt and grit, which can act like sandpaper, to a minimum, limiting scratches. Using strategically placed mats and rugs can help protect your floor. Oak hardwood floors that have been properly finished are the easiest of all floor surfaces to keep clean and new looking. Carpets will show wear and tear, regardless of the amount of vacuuming and cleaning that is applied. Carpets also retain dust and allergens, making wooden flooring and even better choice for people who suffer with allergies. In order to maintain the appearance of your oak flooring, vacuuming and dust mopping should be carried out often, weekly being ideal. A damp mop can be used for spills, but in general you should never use a wet mop and lots of water on wood floors. If your wood floor is waxed, an occasional buffing will help to renew the shine and remove any scuff marks. Oak flooring is know for its high permeability which makes it easier to stain and as a result oak flooring can be purchased in a variety of colors to suit any room in your home. Oak hardwood flooring can make any room feel airy and more spacious and will give your home a feeling of warmth and elegance. When the mighty has fallen why not make use of it in your home. I have made a terrible mistake. Recently I had red oak hardwood flooring installed in my great room and hallways. Unfortunately I did not see before hand what the final product would look like. Needlesss to say I hate the grainy look of the floor. Is there any way to minimize the grain without totally removing the floor? There’s not really much you can do aside from maybe putting a few additional coats of sealer/finish to help fill in the grain. This cannot be done though if you bought pre-finished flooring as polyurethanes will just make a mess of your floor – not to mention void your warranty. Lucky you! The bigger question is: do you think you will need to refinish the floors? If so, I wouldn’t worry too much about what you use to clean them if you’re going to strip them. If you’re not going to refinish the floors, you want to clean them with a product that is made for wood floors – but not something like orange-glo or other citrus based cleaners as they are a nightmare to completely remove and will ruin the finish you have now. Easiest thing to do is go to a hardware or home improvement store and check to see what they have. What is corasin or corazone oak? I think it has few lines? Are you looking for a wood that has a minimal grain? Sugar Maple is a wood that has a minimal grain to it and has more of a contemporary feel. It is a bit difficult to stain and will amber slightly when exposed to sunlight. My daughter bought a house where the oak floor has damage from where the nails to an old bannister had been as well as a gray area which I assume must have been water damage. The floors were finished with a clear shellac but the damage still shows. Will sanding and staining hide these problems or would the boards have to be replaced? I would consult a local professional as I am unable to see the stain or water damage. They can assess the issue and address your concerns. Hi I recently purchased red oak and had it installed all over the home. The installed had a young guy working for him and with his mallet to knock in the tongue and groove, hit too hard on many of the planks and now has bumps that are really driving me insane. I have called the installer and he said he would replace them for free but he has to cut them out with his saw and glue them in place. He has already done 3 and I can tell exactly where it was done. Should he redo the whole area it’s about 9 feet by 4 feet the area that has the most bumps and there are about 14 bump outs on the edge of the floor that show. What should I do?? That would be a huge disappointment after making the choice to install oak flooring. I am huge advocate for sustainability and the least amount of waste and it breaks my heart to hear that his solution is not working out. If he does decide to tear out and reinstall perhaps you could suggest reusing the pieces if it can still be done. Come back and let us know if he offers to reinstall! We recently built a new home and had red oak flooring installed. The floors were stained a very dark beautiful color. However, before the polyurethane was put on the floors, the cabinets were installed and mud was tracked all over the floors. I’m concerned that when the floors are finished, I will be able to tell where the mud traffic was and the floors will show scratchs. Are the floors damaged and can they be fixed even after the floor are sealed? I would be sure to use an appropriate wood floor cleaner, and clean the floor well before applying the sealant. There is a helpful article on cleaning hardwood floors at Cleaning Hardwood Flooring . You could also use StainSolver with a gentle brush to get into the grain, if there is mud in the grain. Hi- We are now in the process of having red oak flooring put in almost all of the common areas of our house. It is looking so nice we are thinking of having our front entryway (currently white tile) switched also to the oak. The house, although new, has a fair number of craftsman style design elements. If we do the entryway we are considering a simple design like a “picture frame” or a dark accent strip framing the rectangular entryway. Do you know if there is any kind of craftsman style entryway pattern we might adopt? The entry hall is 6′ x 10′. The alternative would just be straight boards like in the rest of the house. Any thoughts are appreciated! Decorating is a personal choice that is very hard to assist on, especially when not seeing the room or house. There are many online sites and magazines to browse through that offer decorating suggestions, you may see exactly what you are looking for. got an oak floor, its getting very scratched and dirty in high trafficed areas. is there anything i can treat it with? If your wood floor is waxed, an occasional buffing will help to renew the shine and remove any scuff marks. If it is not, it is possible that the floor needs to be refinished/resealed in those areas.